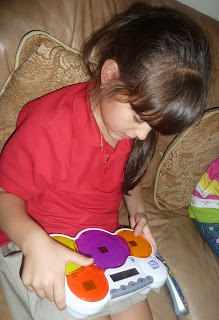 This week I had to opportunity to review a fun, portable game that helps kids review math facts on the go! 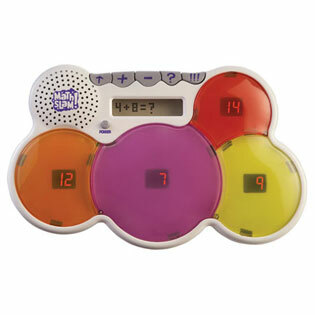 A slammin new way to learn math? I'm all for it & Educational Insights Math Slam certainly delivers! All these features make this a great multi-age, multi-ability level game that can be utilized both at home, on the go and in the classroom. This is a high quality product - sturdy in it's construction, easy to turn on and off and select a game and level of play, fun flashing lights and engaging audio sounds that provide instant feedback. 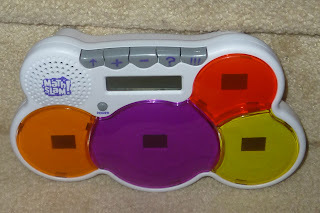 Kids hear a beep for correct answers and a bong sound for incorrect answers. I like that the incorrect answers are repeated giving the child the opportunity to work out their answer and try again. Games are also timed which allows children to work to "beat" their best timed scores for answering the 10 math questions. My Little Diva really enjoyed slamming down the correct answer - it definitely kept the game lively along with the flashing lights & sounds. I appreciate that there are 4 levels to the game. This means it will be around for a long while and will grow along with my girls math abilities. Right now my kindergartener is able to play some of the basic levels on her own but this game has definitely made both her & her little sister a lot more interested in math. We sit and play some of the harder games like Mystery Number and Triple Slam together at their request. Math Slam definitely gets the Lil Diva seal of approval! to One (1) lucky Mom to 2 Posh Lil Divas Reader! 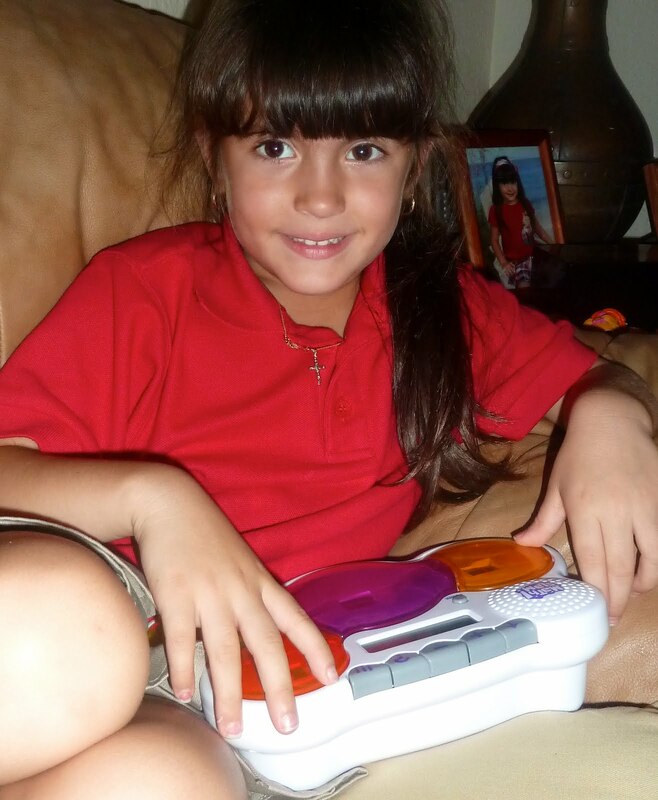 Leave me a comment on your thoughts about the Math Slam game. Please include your email w/your comment so I can find you if you're our winner! so I can get back to you if you win! "Like" Educational Insights on Facebook - I'd love for you tell them I sent you! Winner will be chosen via random.org. & contacted via email if an email is given . Winner will have 48 hours to claim their prize. Please note any entries that can not be verified will be disqualified. Disclaimer: I received Math Slam for free for the purposes of trying it out for this review. That being said, this review is my 100% honest opinion of this product - I am not paid for my reviews or optinions! They are 100% mine! Please remember that your opinions and tastes might differ from mine. That seems like it would be a great math game. They would learn without really knowing it. The game looks very interesting. I like how it is versitile for different levels and ages. Both my school aged kids could benefit from math slam. I follow Mom to 2 Posh Lil Divas publicly via GFC. It looks like something my son will enjoy! I think this would be awesome. Kids would learn while they think they are playing! Like EI on FB told them you sent me. I love Ed. Insights! This game looks great and would be perfect for my little guy. I also like the fact that it has a headphone jack so it can be taken on road/train trips!! this looks like it would be so helpful! 1 Follow Mom to 2 Posh Lil Divas on Facebook Lisa W.
2 Follow Mom to 2 Posh Lil Divas on Facebook Lisa W.
3 Follow Mom to 2 Posh Lil Divas on Facebook Lisa W.
"Like" Educational Insights on Facebook Lisa W.
I love this! This is so cool my daughter would get a kick out of playing this!! I like the fact that its educational and that you get too choose the type of problem you want to do...since my daughter is young she does not need dividing and multiplying yet!! Love it. I love games that teach them something! I've always been terrible at math but I'm hoping my daughters are better at it. I think this would help make math fun. it looks like a fun way to learn! I think this is great. Another tool to reinforce math facts - plus it's fun! I would love to win this for my 3rd grade daughter. Apparently, dyslexia crosses over into other subjects as well *sigh* and she is very delayed.